What if Shakespeare had conceived the melancholy Dane as a costumed crime fighter? Bat-Hamlet tells the tale of a Dark Knight that emerges from betwixt the pages of Shakespeare to exact revenge on his murderous uncle, King Jester. Once resolved to avenge beloved King Police Commissioner Gordrick's death, Hamlet dons the persona of Bat-Hamlet, a flashier and much cooler version of his brooding youth. PURCHASE YOUR TICKETS ONLINE AND SAVE $5! 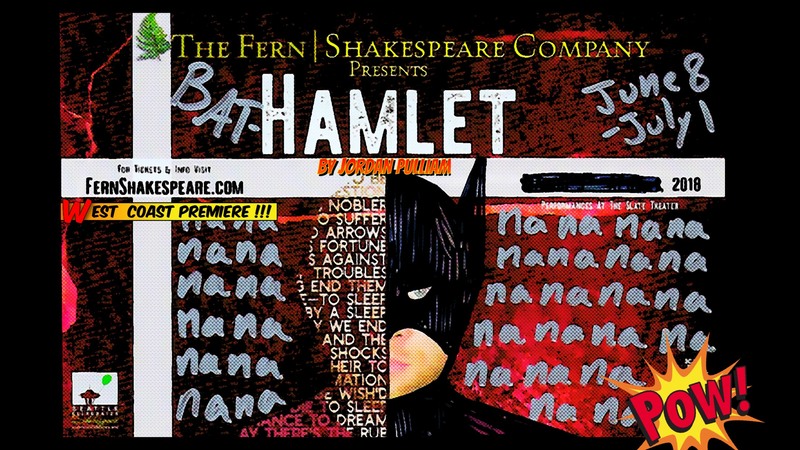 Bat Hamlet runs June 8th - July 1st at The Slate Theater. Thursday-Saturday 7:30 pm. Sunday 6:30pm. Optional trivia game before every Sunday performance starting at 5:30 until curtain!